Now that most people are pay TV and streaming services users, how do they see the services stacking up against each other? Here’s how the two TV services compare in four critical categories. The Hollywood Reporter asked a group of 2,201 US adults to rate their satisfaction with pay TV and streaming services across 16 categories. Here’s how the two services stack up against each other in four critical areas. 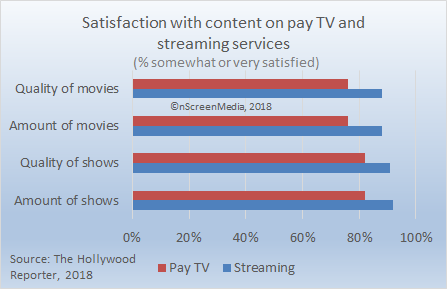 People are more satisfied with both the selection and quality of TV shows and movies available from their streaming services. That’s not to say that people are unhappy with either. 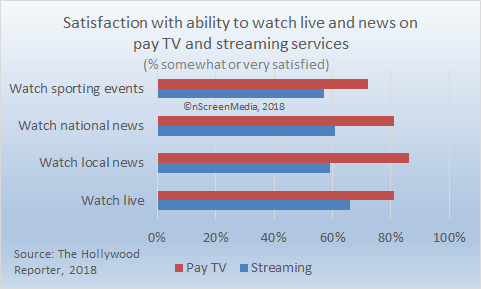 8-in-10 are satisfied with the quality and quantity of movies and TV shows through their pay TV operator, 9-in-10 say the same of their streaming service. 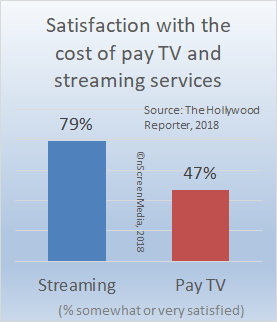 It is somewhat surprising that consumers should be more satisfied with streaming than pay TV for movies. Cable and satellite operators generally have newer movies available on-demand in a much earlier window than streaming services like Netflix and Hulu. However, it could be that people discount those movies because they are only available pay-per-view. Pay TV remains the go-to service for consumers when it comes to news, live TV, and sports. For example, 86% of adults say they are somewhat or very satisfied with their ability to watch local news on pay TV. 59% said the same for streaming services. National news is another area of sharp difference. 81% of the survey participants say they are satisfied with pay TV’s ability to deliver national news versus 61% for streaming. It is not surprising that news and sports are areas of vulnerability for streaming services. Netflix, Amazon Prime Video, and Hulu (not Hulu Live) are the three services most people currently use. They do not provide any news and only occasional premium sporting events. However, there is a reason to believe that streaming services could be poised to erode pay TV’s advantage. Online live news services like CBSN, Newsy, and Cheddar are becoming more popular. Aggregation services like Pluto TV are making it easier to find them. As well, vMVPD services continue to grow their subscriber base. Not surprisingly, the service cost was the category with the largest difference between streaming and pay TV. 79% of adults said they were somewhat or very satisfied with the cost of their streaming services. Under half said the same of their pay TV service. It’s hard to see how pay TV can make any progress on cost versus streaming services like Netflix and Amazon Prime Video. Programmers continue to increase license fees well above inflation. As well, one of pay TV’s big advantages is also the biggest driver of cost increases. PwC forecasts sports rights will grow at a compound annual growth rate of 4.5% through 2022. Consumers say their satisfaction is higher with streaming services versus pay TV across a range of features. 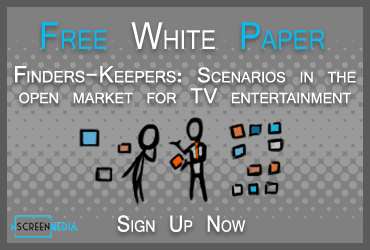 One key area where pay TV still has a substantial advantage is news and live sports. Online services are eroding the advantage with the news. Live sports licensing fees are contributing to the lower satisfaction with pay TV cost over streaming services.